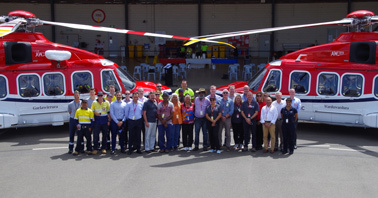 This week, CHC Helicopter unveiled the Ngarluma names of their two new AW189 helicopters in Karratha. The chosen names, Garlawirrura and Warduwardura, are the Ngarluma words for dragonfly and a small inland grass bird that hovers. The two twin-engine aircraft carry up to 16 passengers per flight to and from Woodside’s installations on the North West Shelf. They were the first super-medium helicopters introduced into Australia earlier this year and represent a new generation of aircraft. CHC recognises the importance of learning and celebrating the indigenous languages in the communities in which it operates and asked the Ngarluma community permission to give the two aircraft Ngarluma names. The aircraft are based at the Karratha Airport.